The Protocol for Relaxation by Dr. Karen Overall is a step-by-step method for teaching a dog to relax and chill out. At face value it looks a lot like proofing a stay in the slowest manner possible, and I often describe it as boring the dog into submission. While the actual protocol linked above goes into great detail about how to get started, I've noticed that different people use it for different purposes. Is it an exercise for proofing a long stay? Is it a method for teaching a dog to relax on cue? Does it matter whether the dog moves during the protocol? What is it, exactly? Before beginning the Protocol for Relaxation, the dog must already be able to hold a 15-second stay while looking relaxed and happy. This is the primary reason Ru and Ulysses have not completed the Protocol. 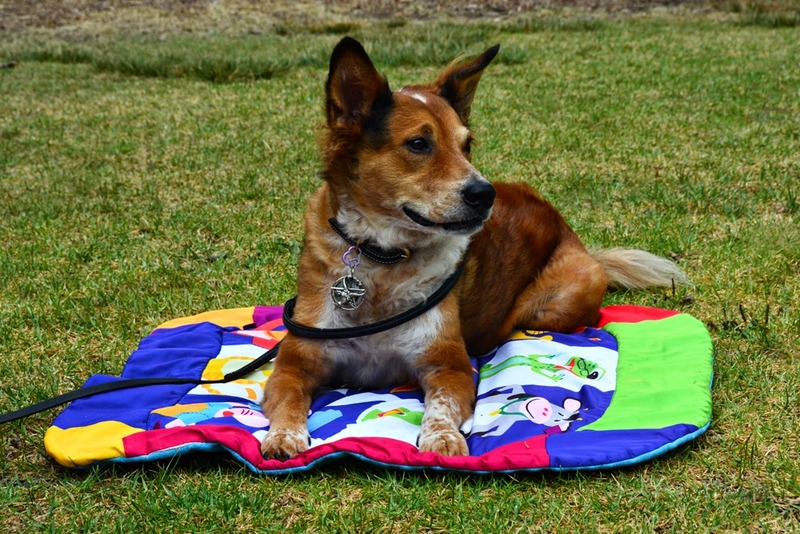 Though a mat for the dog to sit on is not a requirement, I find it really helps Brisbane focus, and also helps him associate the mat with chilling out. I usually set my iPad on the coffee table and glance at it for the nest thing on the list. That doesn't work so well for everyone, and later days require things like 20 seconds of humming and other things that can be difficult to keep track of. The Champion of My Heart blog has mp3 files for each day, with each task timed carefully. A lot of people like to listen to these while working on the Protocol with their dogs, because it's like having someone else read the tasks off and time them. Pre-medication. Brisbane and I worked all the way through all 15 days of the Protocol in about three weeks. I've started and stopped a bunch of times, but hadn't made it all the way through before then. I finally decided that missing a day or two or three didn't mean we had to quit or start over, and we kept plugging along until we got all the way through. I was amazed when Brisbane lounged on his mat as I rang the doorbell. I was even more amazed a few days later when a friend arrived and rang the doorbell without alerting the dogs whatsoever. Admittedly, we did spend several training sessions just working on the doorbell by itself. There's not really any way to work up to that one, and in the beginning I just stood in the front doorway ringing the bell and tossing treats over and over again until Briz stopped barking at it. Same thing with saying "hello", which used to send Brisbane rushing to the door in a flurry of barking, even when I was just answering the phone. I spent most of an afternoon saying "hello" like I really meant it, over and over again, until it ceased to mean anything for him. Before starting this round of the Protocol, I watched many YouTube videos of assorted people doing it. This was when I first realized how different people use it. In my mind, it's a way to help the dog learn to relax, and I want to give them as much freedom as possible to do so. I start by asking for a sit on the mat, and allow Brisbane to decide whether he feels like laying down, rolling over onto one hip, or resting his head on the floor. I want him to ooze into a puddle of rest on the floor so I will know right away which exercises concern him. Not everyone uses the Protocol this way, however. In one of the videos, the handler was using the Protocol to proof a stay for competition obedience. This handler commented that her puppy had rolled into a more relaxed sit during the exercise, and that this was a bad thing. A blogger sharing her experience described her dog failing the day's tasks by breaking her stay to reach for a dropped treat on the second-to-last exercise. Meanwhile, a different blogger released her dog from the stay after each individual exercise so the dog could make the choice to participate or not. I use the Protocol for Relaxation for my dogs, and not for myself. They are free to change positions, and even get up and leave if they feel so inclined. It is my job to keep them engaged, keep up the rate of reinforcement, and keep the exercises easy enough that they can easily choose to stay. If they get up, I pick up the mat and put the treats away until I feel like doing another session. When Brisbane and I were doing the Protocol and got to something super exciting that made him jump up, I would stop and wait for him to decide to return to the mat and sit or lay down before continuing. 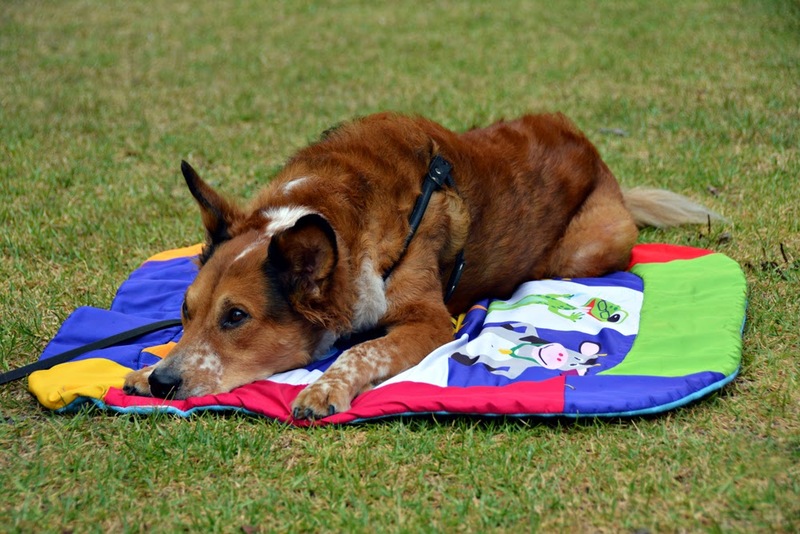 This has helped him learn that the mat is a place where good things happen, and staying there is nice, without feeling trapped on compelled to stay when he is uncomfortable. I need to start the Protocol with Uly and Ru. I recently rearranged the furniture in my main room to make more space for training, I might even start recording them on video for other handlers to learn from and critique.